We’re here to elevate your spirits! We make all of our ice cream, sherbet and italian ice right here in our kitchen. It’s homemade and made several days a week, so it’s always fresh! Yum! We love supporting local. We are local! To create our special flavors, we use the highest quality ingredients. For 40 years, we have featured locally grown berries and regionally grown nuts. We use natural flavors, and for a few of our ice creams, natural colors. (Example: Chlorophyll makes our Mint Chip green! Cool!) Most of our ice creams are colored only by the fruits, chocolates or other flavor ingredients in the name. Think of a beautifully red, fresh, local strawberry from our friends as Graysmarsh Farms; we use them in our Strawberry ice cream and this makes our ice cream a sweet pink! We offer a minimum of 30 popular flavors at a time, and our selection changes seasonally. 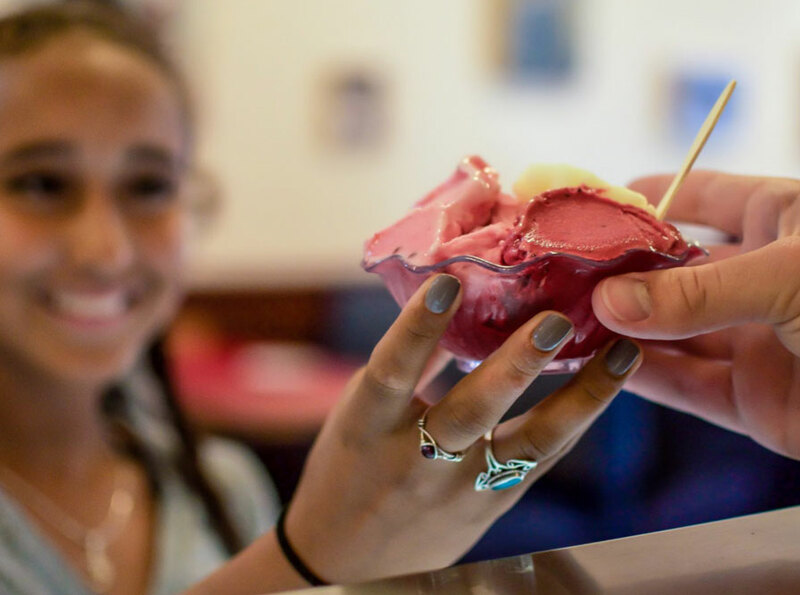 Although ice cream is always the most popular, we also offer 2 flavors of sherbet and 8 Italian Ices (non-dairy) along with 20-22 flavors of ice cream. Our recipe repertoire is extensive, and although we are always creating new flavors, there are some flavors which our customers insist must always be available. Pick-up a quart to go! Ask any of our friendly staff to try any of our delicious homemade ice creams, sherbets and non-dairy italian ices! Then, take a quart home!